What on earth are we missing? 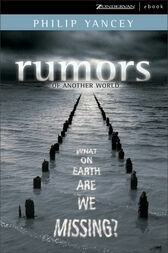 Philip Yancey believes we are missing the supernatural hidden in everyday life.In Rumors of Another World, Yancey investigates the natural world and discovers the supernatural hiding in plain view. He grapples with why God made the world and what our role truly is, and seeks to answer the question, “How do I live in the natural world while expressing the values of the supernatural?”Philip writes, “I have come to understand faith as the highest form of integrated encounter. Faith puts together, assembles, re-orders, accepting the entire world as God’s handiwork. We live among clues, like rescuers sifting through pieces of stained glass shattered by a bomb, and only with a blueprint or some memory of original design can we begin to connect the shards, to assemble them into a pattern that makes sense of our world.“Nature and supernature are not two separate worlds, but different expressions of the same reality. To encounter the world as a whole, we need a more supernatural awareness of the natural world.”Yancey invites readers to join him on a journey of discovery. He challenges us to tune into “rumors of another world,” and connect the seen with the unseen. He promises that the grace-filled result will be a life of beauty, purpose, freedom, and faith.